Heading to the woods is a spring ritual for the outdoorsy type. 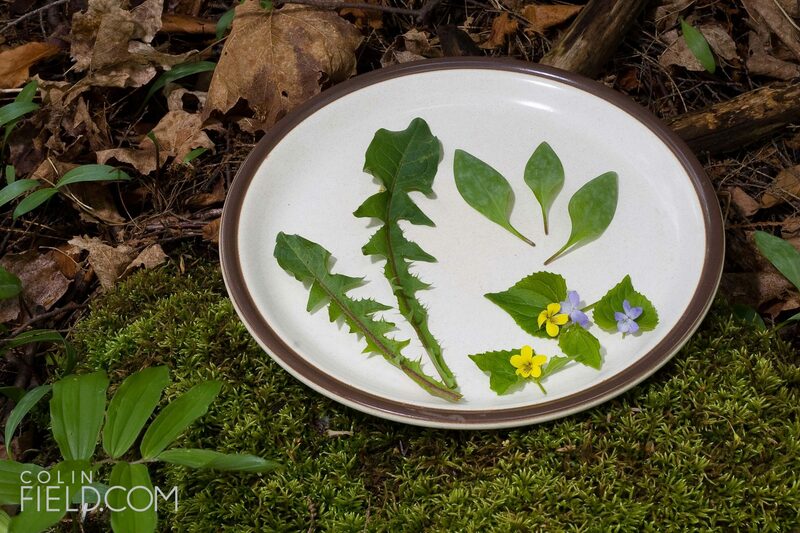 And at this time of year, a hike along the Bruce Trail, reveals a smorgasbord of edibles. To the untrained eye, the green sprouts of undergrowth look no different than a house-plant, but ginger, garlic and leeks are ready for the plucking. And once you know what you’re looking for, you’ll see just how incredibly abundant these foods are. Of course, there are a couple precautions to take before you start chomping on everything in the forest. Firstly, if you’re not 100 per cent sure what you’re looking at don’t eat it! And keep in mind when harvesting wild plants there are significant conservation, legal, health and environmental concerns to respect as well. Harvest responsibly and selectively to ensure enough of the plant is left to grow in years to come and gather edible plants in areas free from pollutants or chemical treatments. It’s also important not to pick endangered or rare species. That said, here’s a list of the easiest to find and safest foods out there. Happy foraging! Trout lilies (also known as dog-toothed violet or adder’s tongue) are low-growing edible plants found in clusters in wooded. In early spring, when still young, the trout lily is a single silver or grey-mottled smooth leaf on a purple stock. A yellow flower develops later in the season. The leaves are best enjoyed when young, before flowering, tossed in a salad of other baby greens with a light vinaigrette. The leaves have a bright, slightly peppery green taste. Violets are a common sight in spring all along the Bruce Trail and add a sunny splash of colour among the bright greens of spring. The plant can be recognized by the five-petalled flower and the upside-down heart-shaped leaves. Both the leaves and flowers are edible, but the leaves are especially packed with vitamin C. Shade-harvested violets have a nicer taste than those growing in sunlight. Add leaves to salads, sautés or soups. Flowers can be candied or tossed into salads for a striking contrast to greens. While these familiar plants may be the bane of landscapers everywhere they are prized in the foraging world where there is no such thing as a weed. The oblong, sharp and irregular-lobed leaves are high in vitamins A and C and can be eaten raw in salads, sautéed lightly, or smothered in cheese sauce and broiled for a delicious gratin. They are best picked before flowering. Young flowerbuds can be pickled like capers. Once in bloom, use the flowers for fritters or for dandelion wine. Naturally, avoid harvesting from lawns or areas where chemicals have been sprayed. One whiff of the root of this wild edible and you’ll be craving gingersnaps. Though more subtle in flavour than the store-bought tropical variety, there is no mistaking its gingery taste. Identify the plant by its two large heart-shaped leaves atop two wooly leafstalks. Nestled between the stalks is a single maroon bell-shaped flower that blooms from April to May. The long horizontal roots grow not too deep in the soil and, once cleaned, can be candied, infused for tea or dried and powdered for use as a substitute for commercial ginger. Look for wild ginger in wooded and rocky sections of the Bruce Trail. Also known as wild onion, wild garlic or ramps, wild leeks are prized among gourmets and are a treasured edible plant during spring. A patch of wild leeks can be recognized by the onion-like scent before spotting them. The plant has two or three broad, smooth, light green leaves and grows in patches. Harvest the entire plant, right down to the whitish bulb for use in soups, salads, sautées, stir-fries or pickles. 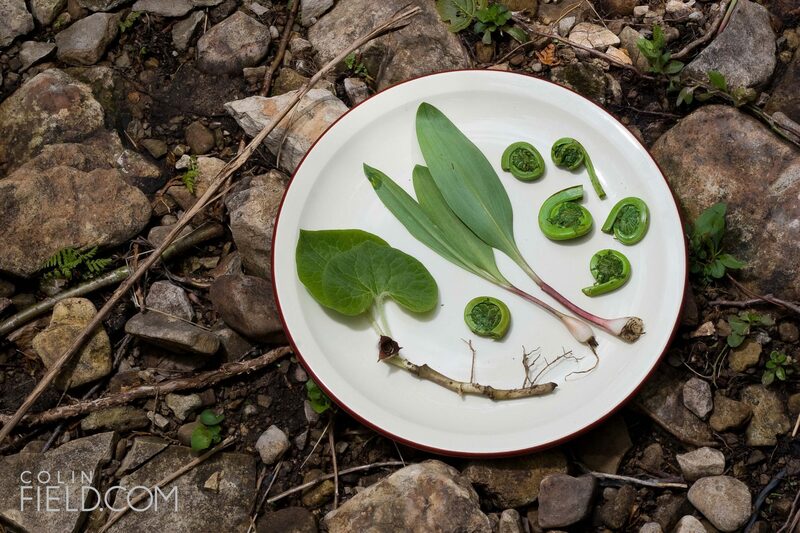 Look for wild leeks in rich moist soils and deciduous forests along the Bruce Trail and share your secret stash with your closest friends only. Because you are digging the roots, be sure to leave more in a patch than you take to ensure growth in the years to come. Look for these epicurean delights in moist areas along the edges of rivers and swamps. Fiddleheads are the emerald-green tightly-coiled beginnings of the ostrich fern. Gather when less than six inches high and still tightly curled. They are inedible once unfurled. Use in salads or as a side vegetable. Be sure to gather furled fronds of the ostrich fern only, as other ferns may be toxic. Keep your eye out in summer for a patch of easily recognized ostrich ferns and remember the spot for spring to be sure of the variety.